• Special Report: Why stealing bases is so vital in today’s game of college and high school baseball. 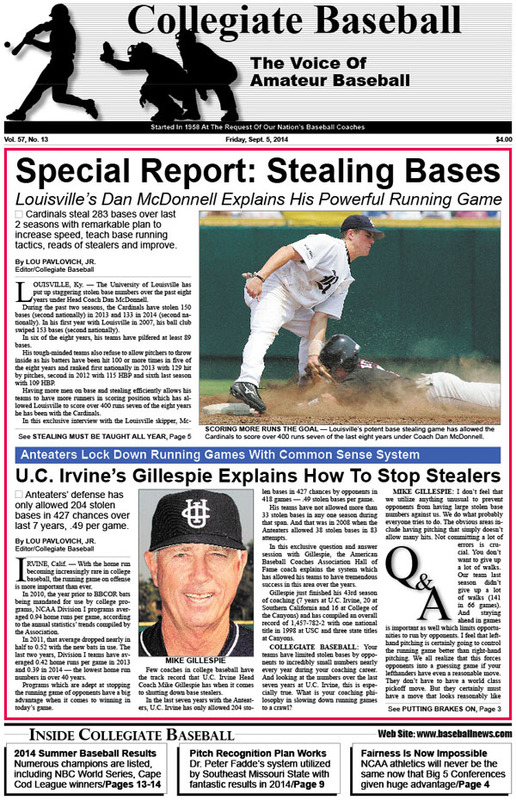 • Louisville’s Dan McDonnell explains his powerful running game that has produced 283 stolen bases over last 2 seasons. • U.C. Irvine Coach Mike Gillespie explains how to stop the running game. Over the last 7 years, his teams have only allowed 204 stolen bases in 427 chances. • Extensive College Baseball Summer Coverage: Complete look at who won the various college summer leagues across the nation. • In-depth coverage of NBC World Series. • Cape Cod championship series winner, top players. • All-star teams in various summer leagues . • $40 million master plan scheduled at Mississippi State to redo ballpark. • Editorial: Arms race has just been throttled up with Big 5 Conferences being allowed autonomy. • Lou Pavlovich Column: Weighted ball training for pitchers had its start 51 years ago at Michigan State under Danny Litwhiler. • Charlie Greene Column: Infielders must be ready for options on third outs to prevent bad mistakes. • Pitch Recognition plan from Dr. Peter Fadde pays big dividends for Southeast Missouri State University. • New NCAA Rules: 2015 rules focus on umpires getting calls right. • New High School Rules: Video monitoring during games for coaching purposes will be allowed starting in 2015. • Amherst travels to Japan after $250,000 travel costs covered. • Elite UCLA closer David Berg will return for senior season. • Obituaries: Legends of college coaching, John Winkin and Ron Oestrike, pass. • USA Baseball coverage: Collegiate national team wins Honkball Week in the Netherlands over Japan but closes season with 5 straight losses against Cuba. We also look at the top players on the Collegiate national team. Plus, we look at the 15 & Under national team as it finished second to Cuba at the WBSC 15U World Cup. • Ruleball With Rich Marazzi: Balk calls create interesting situations in pro rules. To order the Sept. 5, 2014 edition of Collegiate Baseball or subscribe, CLICK HERE.